I'd heard so much about indie author Amanda Hocking that I wondered if her books really lived up to the hype. And I'm so happy to report that, yes, they do. 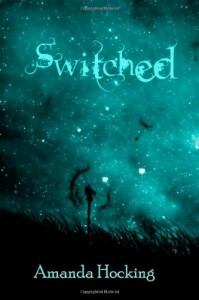 Switched is one of those angsty, teenage urban fantasies. But this is no Twilight. The unique plot moves swiftly, the heroine is feisty, and the love interest is appealing. It's a book that will make you want to finish the series. The one thing I did have trouble with, however, was the world building. Hocking does an excellent job with her concept (that trolls have planted their offspring - or, changlings - into human families), yet there were times when the details didn't quite hold up to scrutiny. It wasn't that the world building was bad, it's just that it stretched my imagination more than I would have liked. Hocking has recently gone from an unknown indie to a high-paid traditional writer, and she deserves every bit of her newfound fame. My only regret is that I didn't 'discover' her earlier.